Earlier this month, the Partnership to Advance Youth Apprenticeships (PAYA), of which Advance CTE is one of the partners, held a national meeting in Charleston, South Carolina. This convening included educators, employers, policymakers, community leaders and PAYA partners. Over the course of two days, PAYA featured sessions such as: panels on the perspectives from school districts, employers, students and national leaders; a keynote presentation from Barbara Humpton, CEO of Siemens USA and Chair of the Siemens Foundation; a discussion with Mayor Randall Woodfin of Birmingham, Alabama and a tour of the youth apprenticeship labs at Trident Technical College. Advance CTE also led a session, Seeing Connections in PAYA & Perkins, which walked through the major components of Perkins V and how Perkins V and PAYA’s principles align. The conference began by highlighting the success of youth apprenticeships through personal examples of new opportunities and achievements. Data demonstrating the impact of youth apprenticeships was also shared, for example for $1 the government puts into apprenticeships, there is a $23 return on investment. Stephanie Walters, Adult Apprentice and Charleston Regional Youth Apprenticeships, Robert Bosch LLC. The impressive group spoke about what led them to their apprenticeships, what they are getting out of their programs and their plans for continuing education and employment. Most were prompted to explore apprenticeships by parents, school counselors or teachers who believed in the potential of these programs. All on the panel shared that it was difficult to make the decision to enroll in a youth apprenticeship program instead of the traditional educational path that their peers were on, and that they themselves had always planned on doing. However, there was unanimous agreement that the program is well worth it, and that the ability to follow their passions by combining work and academic skills has been incredibly positive. To learn more about how youth apprenticeships work for students, check out this infographic from PAYA. Attendees had the opportunity to tour the meeting location’s, Trident Technical College, culinary, nursing and industrial mechanics lab spaces where youth apprentices’ technical coursework is held. Each space was designed to provide students with the best and most realistic learning experience. 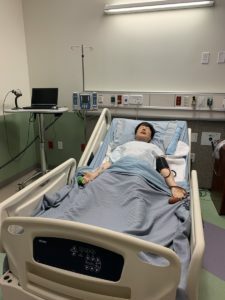 For example, the nursing lab space includes replicas of hospital rooms, so that students can gain hands-on experiences in a setting that mirrors the workplace.The lab experience includes high fidelity mannequins that can mock different scenarios that a participant can expect to encounter in a patient. The mannequins are able to make noise, change color and even produce fluids. Students are able to apply the knowledge and skills they learn on the mannequins, setting them up for success in the workplace. For more information on the intersection of Career Technical Education (CTE) and youth apprenticeships read Advance CTE’s blog, Incorporating Youth Apprenticeships in CTE Pathways. To learn about best practices, as well as common challenges linking CTE and apprenticeships, check out a report from Advance CTE in partnership with JFF, Vivayic and RTI International, Opportunities for Connecting Secondary CTE Students and Apprenticeships. This report was developed through a contract with the Office of Career, Technical, and Adult Education, at the U.S. Department of Education. This entry was posted on Monday, March 25th, 2019 at 8:29 am	and is filed under Uncategorized. You can follow any responses to this entry through the RSS 2.0 feed. Both comments and pings are currently closed.